For example, you’re running a mp3 site on wordpress and hosting audio files on your own server. By default when an user click on a mp3 file link, it automatically play the audio instead of downloading. This could make your site user annoying as he have to right click on the file and choose Save As to download it. In this article, we will show you how to Force Download of Mp3 files instead of Streaming without plugins. You can disable this streaming feature in WordPress by add some lines of code in your WordPress site’s .htaccess file located in the root directory of your wordpress install. To edit the .htaccess file you need to login into your hosting and navigate to File Manager. Once navigated to your file manager, you will find a .htaccess file in your site’s root directory. .htaccess is a hidden file by default, so if you can’t find it on your server, you need to make sure that you have enabled your file manager to show hidden files. Now save your .htaccess file. That’s all you need to do. Streaming feature is now disabled on your WordPress site and people can download mp3 files hosting on your blog by just click on it. We hope this article will help you to learn How to force download after a click on the mp3 file link. For questions and feedback you can leave a comment below or join us on our forum. Knowing how to reset your WordPress password from phpMyAdmin is one of the essential things you should know about because for some reason if your site is hacked, or something else, you are no longer able to login to your admin panel using the login information, and you are not able to reset the password via email, this method can be very useful. We have helped three users with the same issue therefore we have decided to do this writeup. It is always good to know the name of your WordPress Database. Sometimes you might be running multiple installations within the same database, then you will need to know exactly where to look for to reset the password. The best place to look is your wp-config.php file which is located in your root WordPress Directory. In there you will find the name of your database. In your cPanel or other admin panel, you will need to access your MySQL database and then browse it via phpMyAdmin. Once you are in phpMyAdmin, you will need to select the correct database on the left hand side. Look for the name that you found in your wp-config.php and click on that. You will see a list of tables with a prefix wp_ for the most part. If you changed your prefix during installation, then you would be looking for that specific prefix “for ex: wp673_”. You will look for the table wp_users, click on it and then click on the Browse Tab. Click on the Pencil (Edit) Icon to reset your Password. Edit the user_pass field value. You will notice that there are a lot of random characters in the password field. Due to security reasons, WordPress stores the passwords as MD5 Hash rather than Plain text. This means that you will not be able to enter plain text as the password. You would need to use one of the MD5 generators online to generate your password. Simply type your password in that tool and generate MD5 results. Copy and paste the code you get from the converter into your phpMyAdmin field and click Go to save changes. You have now successfully changed your WordPress Password from phpMyAdmin. For some themes, like Soundcheck, there is existing CSS in the theme that will convert your menu item to a photo. All you need to do is add the class to a custom link that the theme documentation refers to. If you are looking to implement your own CSS styling on your menu items, you will need aWordPress.com plan which includes advanced customization. 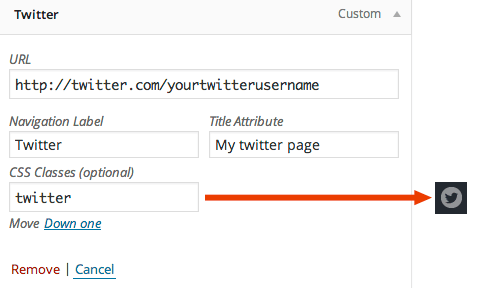 In the above example, you could then stylize the link with the selector .twitter in your CSS. So, a client of yours says they like a site, and we should model something similar. If the site is on WordPress I use http://www.wpthemedetector.com/ to extract the theme, and plugins running. This gives me a good idea of where to start. 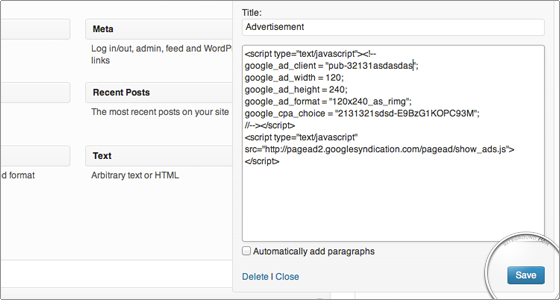 With WordPress you can easily add your AdSense code to your blog. In order to do this, first login to the administrative end of your website. 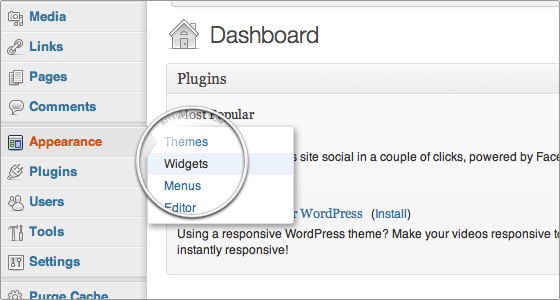 Then, go to the Appearance -> Widgets menu. 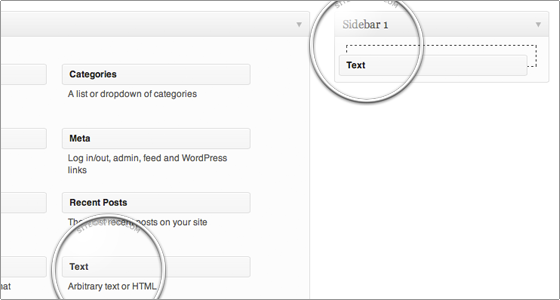 In this page select to drag-and-drop a “Text” widget onto your registered sidebar. Then you should add a title (in our case – Advertisement) and right under it the actual code that you have obtained from Google. Finally, click on the on the “Save” button right under it. Well done! You have just added your AdSense code to your WordPress blog.